Ask ten people about plant nutrition and you'll probably get ten different answers. This is a simple approach to a complicated subject. I know you're probably not interested in a lot of scientific stuff, but a little knowledge here goes a long way toward successful growing. There are 20 elements necessary for healthy plant growth. Air and water supply carbon, hydrogen, and oxygen. The other 17 mineral elements must be supplied by the growing media or fertilizer amendments. In nature, plants get nutrients from organic debris that collects at the roots. This can be anything from decaying tree bark to bird droppings. Complex interactions involving live bacteria, enzymes, and microbes break down this organic matter so the plant can absorb it. This process is almost impossible with potted plants because potting mixes are sterilized, killing the bacteria needed to transform the organic matter. So potted plants rely on the grower to provide the nutritional elements they need for growth. Plant Food or Plant Nutrients? Don't confuse "Nutrients" with "Plant Food". The real "food" plants use for growing is the light, water, and air. See box at right. Nutrients, on the other hand, are the minerals absorbed at the roots. If you're not giving your plants the proper food they need to grow (light, water, air), your choice of nutrients won't matter. Plants manufacture their own "food". Using the power of the sun, they mix air, light, and water to make carbohydrates. These carbohydrates are the real "food" that stimulates new growth. This process is called "photosynthesis". On the other hand, "Plant Nutrition" is the mineral elements collected by the roots that enhance photosynthesis. These nutritional elements cannot compensate for lack real food plants use for growth (air, light, and water). So, before you give your plants that extra shot of energy with more nutrients, make sure they're getting the "real food" they need for healthy new growth. All fertilizers contain three main elements; Nitrogen(N), Phosphorus(P), and Potash(K). This is called the NPK ratio. Fertilizer packages always have three numbers on the front panel that describes the NPK ratio. The first number is Nitrogen (N), the second is Phosphorus(P), and the third is Potash(K). The numbers describe what percentage of each element is in the fertlizer. This fertilizer has an NPK of 10-15-10. Think of the NPK ratio as the recipe of the ingredients inside the package. Adjusting the balance of these main ingredients during the growing and blooming cycles encourages healthier plants and bigger blooms. More on this later. Urea is an inexpensive form of nitrogen, the primary ingredient in all fertilizers (the first number on the package). Plant roots cannot use urea based nitrogen until it is broken down by enzymes or bacteria. That's great for outside plants, but sterilized potting mixes don't contain the enzymes needed to convert urea into something the plant can use. Unused urea turns to salt and actually becomes harmful to the plant's root system. This is especially true for orchids because orchid roots simply can't tolerate salt. Avoid plant food that has "urea" on the label! You might actually be harming your plants! Check the back - look at source of Nitrogen! Plants need 17 elements for healthy growth. Most fertilizers contain the three main elements (the NPK - Nitrogen, Phosphorus, and Potash). But be on the lookout for the rest of the elements! If your fertilizer doesn't have all the elements you're taking a hit-or-miss approach and your plants could be missing important minerals it needs to grow. Look on the back of the package and see what's in your fertilizer. Why jeapordize your plant's health with cheap fertilizer that's mostly filler? Give them the best - that's what they're looking for! We've all heard about the person who buys only the cheapest fertilizer. Then, they can't wait to tell you about their plant that just had 10 blooms. I say, "if they would use proper nutrition they would have had 20 blooms - and they would have been bigger and lasted longer!" In nature, houseplants live on the forest floor where nutrients are abundant. Their roots grow in a combination of soil, decaying leaves, animal droppings, etc. These plants have the luxury of picking and choosing from an "all you can eat" smorgasboard of available minerals. Houseplants are tolerant about nutrients, so you don't need to be so precise about which fertilizer to use. Orchids, on the other hand, grow where moisture and nutrients can be scarce. To survive in this harsh environment, they have adapted to living comfortably on a slim diet of nutrients. As long as they get plenty of light, water and air - the real food for growth - they're happy. The same is true for your orchids. Give them plenty of the real food for growth - light, water, and air. Don't rely on fertilizer for healthy plants. (okay, be careful with the water.) Use quality fertilizer that has all the elements - and then be stingy when applying it. If a little bit is good, a lot isn't better! I've never seen an orchid die from lack of fertilizer. Organic means "the nutrient contained in the product is derived solely from the remains of once living organism". This includes animal wastes, crop residues, compost and numerous other byproducts of living organisms. Organic fertilizers sound good but most are incomplete in their nutritional value. They contain only one or two nutritional elements so blending different products is necessary. The result is uncontrollable, difficult to measure, and usually carries an odor. You never really know what your plants are getting. Earthworm castings, seaweed, and bat guano head the list of organic remedies. (I'll bet you didn't know there are two kinds of bat guano - one from bats that eat insects and another from bats that eat fruit!) Do you really want to put this stuff on your plants, and in your home? Why take a chance with organics when complete, balanced nutrition is so easy? Here's an organic fertilizer at a local garden center. It's cow manure(!). Looking closer, you can see it's recommended for houseplants? Cow manure in your living room? I grew up on a farm and my relatives would get a good laugh on this one! Note: Don't get overwhelmed with all the nutrient concoctions you see for hydroponics on the Internet. You can grow prize winning plants without it. Ordinary fertilizers rely on the potting mix for many of the elements needed for growth. (That's why they contain fewer elements.) Relying on the media for nutrition is risky because the chemistry of the potting media is constantly changing. Hydroponics doesn't rely on the potting mix for any nutritional value. Hydroponic fertilizers always contain the entire group of nutritional elements plants need - in a form the plant can use immediately. No more worry about the nutrients keeping up with the plant's needs. Conventional media such as bark and moss compact and deteriorate quickly - especially in the heat of summer. 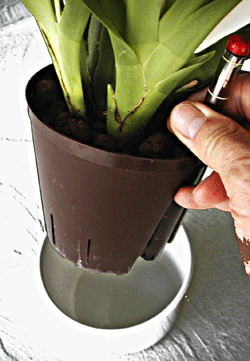 Decaying potting materials trap impurities from the water supply and restrict air flow at the roots. This alters the chemistry and blocks many nutrients from getting to the plant. Your plant is not only robbed from getting what it needs, the unused nutrients turn to salt and eventually become harmful to the roots. If your planting media is old, your fertilizer could actually be killing your plants! The LECA pebbles in our system eliminate the "trapped nutrients syndrome". LECA pebbles are a sterile ceramic that will never compact or decompose, promoting an even flow of air and water over the roots that won't change over time. You'll never get "exhausted media" with LECA. Removing impurities from the system is also easy. Simply take your plant to the sink every couple of months and leach the pebbles thoroughly. The relatively smooth outer shell on the pebbles allows any foreign matter to wash away. This is impossible with bark or moss. Return plant to outer pot for a fresh start. Isn't that easier than repotting! A complete and balanced nutrition program is easy with hydroponics. Just add the nutrients to the water and they go directly to the plant's root system. No complicated biology necessary! You'll see results in a matter of weeks! 1. Start by using a basic "Grow Formula" that has everything your plants needs for growing healthy roots and leaves. Apply every watering. 2. Then, when the plant starts to bloom, switch to "Bloom Formula" that will concentrate on developing bigger and brighter flowers. It's that simple. Orchids have 3 seasons; Grow, Bloom, and Rest. They have internal calendars that determines when each season begins. And the seasons vary with each type of orchid. Some plants bloom in winter, others prefer summer. Don't try to force your plants to change their schedule..
1. Grow formula for the Growing Season. This is the longest and most important season. During the Growing Season orchids are busy growing new leaves and building up the energy to produce flowers. Give your plants plenty of the real food they need for growth (light, water, and air) and compliment that with the basic all purpose Dyna-Gro Grow 7-9-5 formula. It has everything your plants need for robust growth (including trace elements). Notice the NPK ratio (7-9-5) is balanced. 2. Bloom formula for the Blooming Season. A flower spike signals the start of the Bloom Season! (This is what we've been waiting for!) Your plant has built up energy and is ready to burst into bloom! Switch your nutrients to Dyna-Gro Bloom 3-12-6. The change in the NPK ratio lowers the nitrogen(N) and increases Phosphates(P). This encourages bigger and better blooms. Important Note: Bloom fertilizers only enhance the flowers - they don't make your plants bloom. Proper light and cool evening temperatures trigger flower cycles in orchids. 3. Resting Season. After blooming, orchids take a well deserved rest. Don't use any nutrients during this period (4-6 weeks). Cut back on water too. After 4-6 weeks, or when you see new growth, return to the all purpose Grow 7-9-5 formula every watering. Continue until you see a flower spike signaling another burst of blooms. Orchids use all their energy for new leaves during the growing season. New flower spike signals the start of the bloom season! Time to swtich to Bloom nutrients. Other nutritional supplements you might want to try. A unique supplement to be added to Grow or Bloom fomulas as a bloom booster. Plants use Silicon is a benefitical element to reduce stress. Add it to your nutrients to build stronger plants and flowers that resist heat drought. Don't forget about the roots! Give the roots a boost with KLN Rooting Concentrate. While most nurtrient solutions focus on leaves, stems and flowers, KLN promotes vigorous roots. Even mature plants benefit from an occasional KLN treatment. So there you have it - everything you need to kniow for complete, balanced nutrition.